Contest 26 Prize: The Mighty FishDuck! Evil Midnight Lurker and I have completed his prize for winning Caption Contest 26. 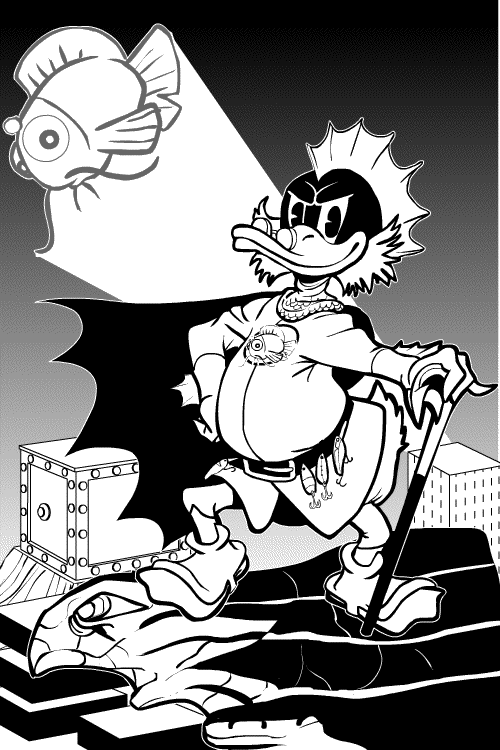 Based entirely on his own imagination and in no way modeled on any current cartoon character owned by a major prone-to-litigation company, here's The Mighty Fishduck! Thanks again to EML and Mighty God King for helping out with that contest. If you want to win your very own custom black and white illustration of whatever you like, head over to Caption Contest 29: Shiver Me Nips going on right now! One Response to Contest 26 Prize: The Mighty FishDuck!